Partners like Artisty Puzzles are supporting the Wild Animal Health Fund (WAHF), which provides funding professional veterinary research to improve the health of zoo animals and wildlife. The results from these funded projects allow zoo and wildlife veterinarians to develop better diagnostic techniques, cure diseases, prevent chronic illness and infection and better manage the pain in wild animals. For every heirloom quality wooden puzzle sold in the WAHF series of Artistry Puzzles, depending on the size of the puzzle sold, either a $2.50 or $5.00 donation goes to the Wild Animal Health Fund. What’s unique about these puzzles is that the ‘back’ of the puzzles are as interesting as the front. 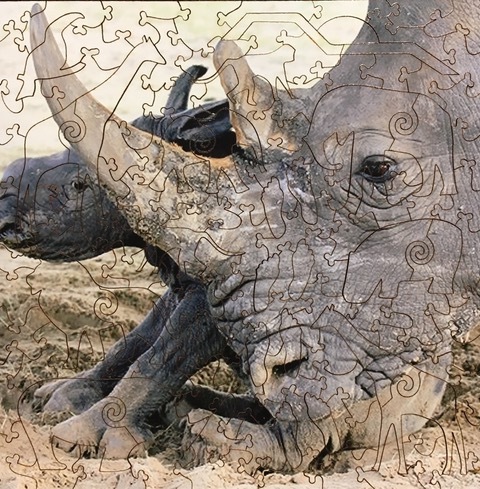 The puzzle shapes reflect aspects of the animal and its natural environment. It’s hard to describe, but you can easily see for yourself. Go to this link. When you click on one of the puzzles, it will take you to a page that has thumbnails of the features of the puzzle. Click on the one that is just plain wood, and you’ll be amazed by what you see. There are three ways you can help grow our Wild Animal Health Fund. 1.) Purchase a puzzle for yourself or as a gift. Check out the cool and unique picture frames that are acrylic on both sides so you can hang them either way. 2.) Share the Artistry Puzzles website with your friends and families. 3.) Purchase one of the 8”x 8” puzzles and share it with your local neighborhood gift shop. Let us know if you need assistance in talking with your gift shop manager for them to carry the puzzles as inventory. In advance, we thank you for considering and purchasing a puzzle. Especially, the animals who can't thank you are grateful.